Seventeen Tantras of the Great Perfection (Tib. རྫོགས་ཆེན་རྒྱུད་བཅུ་བདུན་, dzogchen gyü chu dün, Wyl. rdzogs chen rgyud bcu bdun) of the Category of Pith Instructions, which were brought to Tibet by Vimalamitra and Guru Padmasambhava. Each tantra is not dependent upon the others but complete in itself. The tradition of Vimalamitra adds to them the Tantra of the Wrathful Mother, Protectress of Mantras (ngak sung tröma), to make eighteen in all, while the tradition of Padmasambhava also arrives at a total of eighteen by adding the Tantra of the Blazing Expanse of Luminosity (longsal barma). 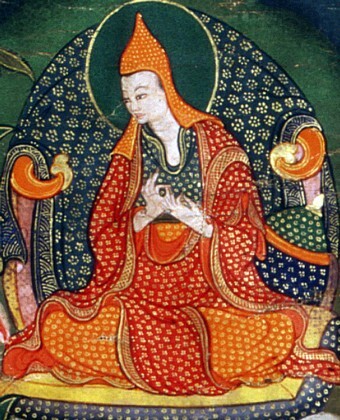 Generally, however, both the Tantra of the Wrathful Mother, Protectress of Mantras, from Vimalamitra’s tradition and the Tantra of the Blazing Expanse of Luminosity from Padmasambhava’s tradition are added to the Seventeen Tantras of the Innermost Secret Nyingtik Cycle, making a total of nineteen altogether. Khenpo Ngawang Palzang, 'The Dzogchen Scriptures' in Quintessential Dzogchen, edited by Erik Pema Kunsang and Marcia Binder Schmidt (Boudhanath, Hong Kong & Esby: Rangjung Yeshe Publications, 2006), pages 72-75. This page was last edited on 23 June 2018, at 21:09.